Glucose 6 phosphate dehydrogenase or G6PD Deficiency is a gene abnormality on the X chromosome that affects red blood cells. G6PD itself is an enzyme that plays a role in various chemical reactions in cells, one of which is to produce reduced nicotinamide compound adenine dinucleotide phosphate or NADPH, which can prevent cell damage due to oxidation. Red blood cells that function to transport and circulate oxygen are more susceptible to oxidation compared to other body cells. In patients with G6PD enzyme deficiency, red blood cells are easily damaged due to various oxidation disorders, such as drugs, chemicals, infections, fava beans, or due to ketoacidosis. This condition causes red blood cells to rupture, which then triggers the occurrence of hemolytic anemia . Antimalarians, a class of drugs used to treat malaria. Sulphonamides, a class of drugs used to treat infections. Aspirin , a drug used to relieve pain, fever and swelling in the body. Some nonsteroidal anti-inflammatory drugs (NSAIDs). Generally patients with G6PD deficiency do not show certain symptoms (asymptomatic). However, when patients are exposed to compounds that can trigger oxidation in cells, hemolytic anemia will occur. After the compound comes out of the patient's body, the symptoms of hemolytic anemia will also disappear on their own. Urine is dark or yellowish orange. The skin and white of the eyes become yellowish. The cause of G6PD deficiency is a mutation in the gene encoding the G6PD enzyme located on the X chromosome, which can be inherited from parents to their children. Opportunities for the emergence of G6PD enzyme deficiency in men are greater than in women because men only have one X chromosome. In women, this condition can arise only if both parents are sufferers or carriers of the G6PD enzyme gene abnormality factor. Detection of G6PD enzyme activity . The method of testing the activity of the G6PD enzyme aims to see the enzyme activity in red blood cells. The test is done by taking the patient's blood sample and then analyzing it in the laboratory. In patients with G6PD enzyme deficiency, enzyme activity will be found to be lower than enzyme activity in normal people. This test can be repeated several times to get more accurate results. The risks of this test include bleeding, headache, hematoma, and infection. Calculation of blood cells . This test is done by counting the number of red blood cells, white blood cells, and blood platelets. The goal is to determine whether anemia occurs in patients with G6PD enzyme deficiency and abnormal blood cell counts. In this test, the patient's blood sample will be taken by a doctor, then performed a calculation through a microscope. Serum hemoglobin test . This test is done by measuring the amount of hemoglobin contained in blood plasma. Normally hemoglobin will be contained in red blood cells and will not be present in blood plasma. But if red blood cells are damaged, there is a possibility that hemoglobin will be contained in blood plasma. In patients with hemolytic anemia, red blood cells will be damaged quickly so that serum hemoglobin levels in blood plasma will increase. Calculation of reticulocyte cells . Reticulocyte cells are red blood cells that have not yet matured. Reticulocyte cells are produced in the bone marrow and then released through blood vessels. Reticulocyte examination is done by taking a blood sample usually from a vein in the elbow fold. The blood taken is then taken to the laboratory to calculate the number of reticulocyte cells. In patients with hemolytic anemia, reticulocyte levels will increase due to damage to red blood cells. Genetic examination. Genetic examination can be done as a confirmation of abnormalities in the G6PD enzyme gene. Genetic examination is done by taking DNA samples in patients, then analyzing by detecting DNA mutations. Examination of peripheral blood erase preparations. Examination of lactate dehydrogenase enzyme levels. Urine examination to detect hemoglobin. The main goal of treatment of G6PD enzyme deficiency is to eliminate the triggers for symptoms of deficiency of these enzymes in patients. If caused by an infection, the treatment given aims to eliminate the infection. If the patient is taking drugs that can trigger the appearance of symptoms of G6PD enzymes, the patient must stop taking these drugs. When hemolytic anemia arises in G6PD deficiency, the treatment given aims to overcome anemia, for example by blood transfusion to replace damaged blood cells, and oxygen therapy to maintain oxygen levels in the blood. Phototherapy for babies. In infants who have G6PD enzyme deficiency, phototherapy is done to remove yellowness on the skin. Yellowness in infants with G6PD deficiency is caused by excessive bilirubin levels due to rupture of red blood cells. The phototherapy method is done by placing the baby in a special incubator that has fluorescent lamps. Light from fluorescent lights will be absorbed by the baby's skin so that bilirubin will be changed and more easily removed from the body through urine and feces. Folic acid supplement. Folic acid can help the formation and maturation of red blood cells. Folic acid in supplement form can be given to patients with G6PD deficiency who experience hemolytic anemia. Vaccination of Hepatitis A and B. Hepatitis A and hepatitis B can trigger damage to red blood cells, especially in patients with G6PD deficiency. To prevent infection, patients are required to undergo hepatitis A and B vaccinations. Especially for babies suffering from G6PD deficiency, checking the condition of the baby regarding excess bilirubin must be routinely performed. The aim is to avoid the occurrence of bilirubin encephalopathy in infants. 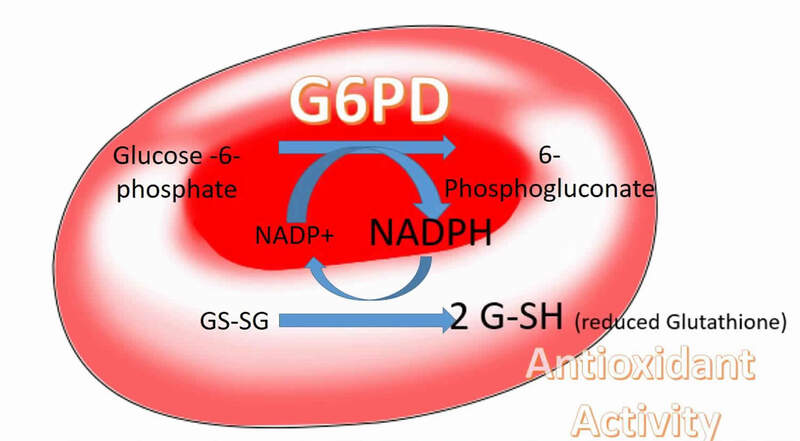 In general, patients with G6PD deficiency can recover well after the trigger factors for the deficiency of the enzyme are eliminated through treatment. However, it is important for patients to know the first treatment step when symptoms of G6PD deficiency reappear. In addition, it is also important for sufferers to avoid drugs and foods that can trigger symptoms. 0 Response to "Glucose 6 Phosphate Dehydrogenase ( G6PD Deficiency ) "